This Luxury Property in Jardines Del Golf is a lovely modern, bright and airy house which can sleep up to 8 persons. 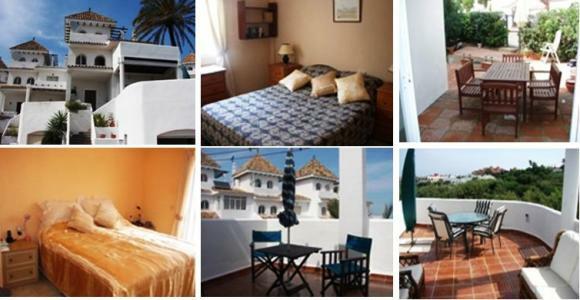 It is located close to Duquesa Golf and Country Club, with its bar and restaurant, gym and indoor pool. The lively Duquesa Marina and fishing village of Castillo are within five minutes walk offering a wide variety of bars and restaurants. The house itself has four large bedrooms and three bathrooms,and can easily sleep eight people. It has a modern kitchen with all appliances. The large lounge and dining areas both lead out onto private terraces. The front terrace gets sun all day, and has lovely views out over Castillo to the shimmering Mediteranean. As well as the front and garden terraces ther are two further large terraces, one outside the master bedroom and the other is a roof terrace adjoinng the rooftop studio bedroom.